But in all of that, I think we often tend to lose sight of an underlying theme which deserves to be brought out into the light. Let’s not forget what Jesus himself said. Here it is in His own words …well, in Isaiah’s words…but this is how Jesus introduced himself and announced his mission statement and kicked off his ministry: by reading out loud a prophecy about Himself which Isaiah had written (Isaiah 61:1-2). Then he rolled up the scroll, gave it back to the attendant and sat down. The eyes of everyone in the synagogue were fastened on him. He began by saying to them, “Today this scripture is fulfilled in your hearing.” – Luke 4:18-20. Wow! How refreshing! He didn’t JUST come to die for my sins. Of course that is the most significant and lasting impact of His time here on Earth in the flesh. But He says here that He came “to proclaim good news to the poor.” They need to hear it! The poor need some good news. They need hope and courage. Jesus says he was sent “to proclaim freedom for the prisoners.” Wow! What is the ONE thing that prisoners are thinking about and desiring? Freedom. And Jesus came to give it to them. Of course He’s talking here not only of people behind bars, but to everyone who is bound by the chains of sin. What greater gift is there than freedom for the prisoner? Especially for those who are prisoners to sin, which carried with it an eternal sentence. “Recovery of sight for the blind.” It’s the miracle that every blind person dreams of. It would change their life forever, in such an all-encompassing dramatic way that those with sight cannot possibly imagine. 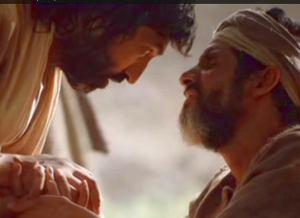 And again, Jesus is speaking not only of those whose physical eyes are not functioning properly, but to those who are blind to the Father and cannot see His love and grace. Luke 19:10 “The Son of Man (Jesus) came to seek and to save the lost.” Again, this is Jesus speaking about himself. What do the lost need more than to be found? To be rescued? Actually, what they need more than just that is to actually be sought out! They need someone to love them so much as to come looking for them, and find them and bring them back home to where they belong. It’s the story of the Good Shepherd who goes in search of the lost lamb, at potential great cost to himself (leaving behind the other sheep on their own). Can’t you picture the innocent lamb cuddling in to the shepherd’s warm embrace? There’s nothing sweeter. There’s nothing greater than the feeling of being sought out and rescued and brought back to the embrace of the one who loves you most. Yes, it is in Jesus’ death and resurrection that we find these things: freedom from sin, recovery of sight, abundant life. But we so often get stuck simply defining Jesus’ death as our ticket into Heaven, and we miss the HOPE and JOY and PEACE that resounds in Jesus’ own words. Let’s agree to remember, and meditate on the HOPE and JOY and PEACE of Christ, and to let these things fill our hearts to overflowing – that is a lifestyle of worship.